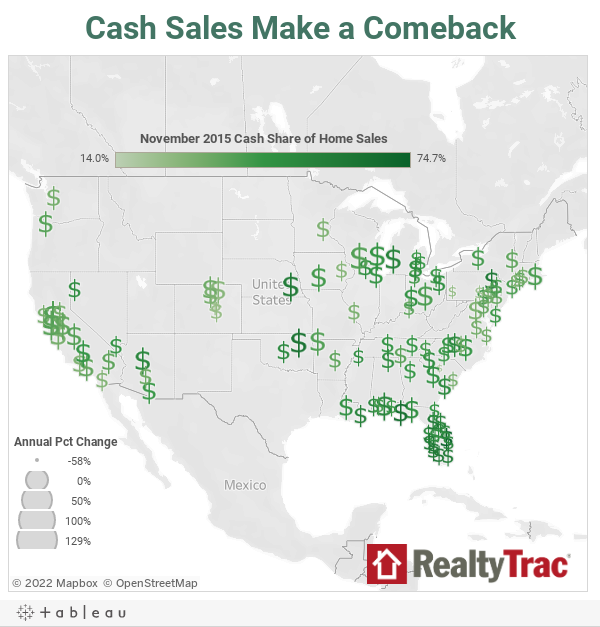 Nearly 40 percent of home sales were cash deals in November. Last November, 38.1 percent of single family home and condo sales were all-cash, up from 29.8 percent in October, according to a new report from RealtyTrac. RealtyTrac vice president Daren Blomquist said the uptick in cash sales is temporary, caused by new federal rules that change how the costs of a loan are disclosed. Blomquist said those changes slowed down the loan process, and that meant "cash buyers have an even bigger leg up on finance buyers than they did before." But Blomquist said once everybody gets used to the new rules, cash sales will slip back to around 30 percent, the norm since 2000. But there&apos;s a caveat, "In terms of global economic stability," he said. That’s a big caveat. More and more wealthy foreigners are paying cash for U.S. real estate, as a hedge against their own tanking economies. Some economists say that’s not about to stop. But mainly on the coasts, in cities like Los Angeles, New York and Washington.